Trying to make this as simple as possible here is a map of which gathering skills go with which crafting skills as well as the mission to take. Your companion can be sent to do your gathering crafting or missions doing this cost money but saves time. Having more points in affection and seeing what your crew member is specialised in may also help when doing missions, they will have more chance to crit, check your crew menu for this. Affection can also lower the time taken to do a mission, harder the mission is the longer it will take and more chance of failing. Reverse Engineering this is the breaking of parts to get back the materials, this can be used on most if not all of your crafted items, so possible using these materials to craft the same thing or something different to level your crafting skill further. Also when breaking these parts up you get a chance of learning a better version of this item to craft for example Green>Blue>Epic which will make the item have better stats or maybe something else. These are the components you will be able to gather or send your companion to collect around the zone your in which are then collected and used to for your crafting skills. Apart from slicing which is more of money making gathering skill.Archaeology is the study of crystal formations and archaeological finds. Crystal formations contain crystals that an Artificer can use to construct lightsaber modifications and armor for Force users. Archaeological finds contain artifact fragments of Force-imbued technology. These valuable items contain ancient formulas and algorithms used in the crafting skills Artifice and Synthweaving. Archaeological finds possibly conceal rare datacron components that are used in the creation of attribute-enhancing Matrix Cubes. Archaeologists can send their companions on missions to gather resources. Power, colour crystals and archaeological items. Recommended to choose:- Artifice, Synthweaving. Bioanalysis is the practice of collecting genetic material from creatures and vegetation. Genetic materials include cell fibers, bacterial strains, toxic extracts and medicinal fluids. Biochemists use these materials to create medpacs to restore health, stimulants (single-use injections) that provide a boost to physical abilities, and biological implants that enhance combat prowess by stimulating neural networks and regulating brain stem functions. The crafting skill Biochem utilizes Bioanalysis resources. Bioanalysts can send their companions on missions to gather resources. Scavenging is the art of salvaging useful parts and base materials such as metals, alloys and synthetic compounds from potential technological resources – junk piles, fallen droids, abandoned cargo and broken-down vehicles. The crafting skills Armormech, Armstech and Cybertech utilize Scavenging resources. Scavengers can send their companions on missions to gather resources. Recommended to choose:- Armormech, Armstech, Cybertech. Credit boxes, misions discoveries and tech schematics. Armormech is the ability to work with hard metals, alloys and synthetic materials to construct armor for non-Force users. Vendor-purchased fluxes are used during the armor creation process to refine the materials to ensure suitability. Armormechs can reverse engineer their crafted armor and possibly discover new ways to improve armor creation. The gathering skill Scavenging provides crafting resources for Armormech. Recommended to choose:- Scavenging, Underworld Trading. Armstech is the ability to work with hard metals, alloys and synthetic materials to craft blasters, blaster modifications and melee weapons. Vendor-purchased fluxes are used during the weapon creation process to refine the materials to ensure suitability. Crafted blasters include blaster pistols, blaster rifles, sniper rifles, assault cannons and shot guns. Blaster modifications include blaster barrels. Melee weapons include vibroblades and electrostaves. Armstechs can reverse engineer their crafted items and possibly discover new ways to improve their creation. The gathering skill Scavenging provides crafting resources for Armstech. Artifice is the delicate skill of constructing lightsaber modifications, enhancements, generators and focii. Lightsaber modifications include color crystals and hilts that augment a Force user’s combat attributes. Color crystals determine beam and bolt color for lightsabers and blasters. Enhancements are modification upgrades for weapons and armor. Artificers can reverse engineer their crafted items and possibly discover new ways to improve their creation. The gathering skill Archaeology provides crafting resources for Artifice. Lightsaber mods, enhancement mods, generators and focii. Recommended to choose:- Archaeology, Treasure Hunting. Biochem is the skill involved in crafting medical supplies, performance-enhancing chemical serums and biological implants. Biochemists can create medpacs to restore health, stimulants (single-use injections) that provide a boost to physical abilities, and biological implants that enhance combat prowess by stimulating neural networks and regulating brain stem functions. Biochemists can reverse engineer their crafted implants and possibly discover new ways to improve implant creation. The gathering skill Bioanalysis provides crafting resources for Biochem. Implants, adrenals, stims and medpacks. Recommended to choose:- Bioanalysis, Diplomacy. Cybertech is the skill to assemble droid armor, earpieces, grenades, armoring, mods and miscellaneous gadgets. Armoring and mods are upgrade modifications that augment combat ability. Earpieces are external mini-computers that are worn on or near the ear. They enhance combat prowess by giving audio and visual feedback to the wearer or through direct neural feedback via an external nerve relay. Cybertechs can reverse engineer their crafted items and possibly discover new ways to improve their creation. 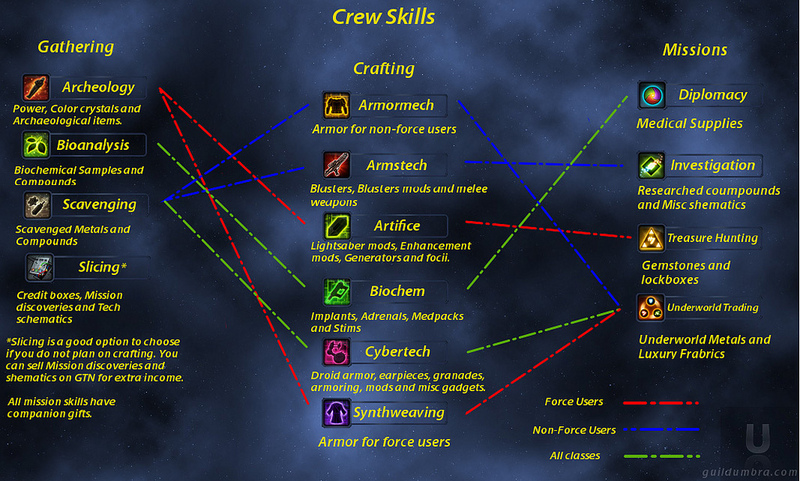 The gathering skills Scavenging provides crafting resources for Cybertech. Droid armour, ear pieces, grenades, armouring, mods and misc gadgets. Synthweaving is the process of fabricating synthetic materials out of crystals, various chemicals and artifact fragments to construct armor for Force users. Vendors provide premade solutions, suspensions and composites that are used during the Synthweaving process. Synthweavers can reverse engineer their crafted armor and possibly discover new ways to improve armor creation. The gathering skill Archaeology provides crafting resources for Synthweaving. Recommended to choose:- Archaeology, Underworld Trading. Diplomacy is the art of conducting and managing negotiations. Sending your companions on diplomatic missions can influence your light side or dark side standing. In addition to light side and dark side influence, possible Diplomacy rewards include rare light armor crafting materials used to construct prototype and artifact light armor, and gifts for companions to raise their Affection rating. Investigation is the skill of researching, gathering, analyzing and decoding secret information. Sending your companions on Investigation missions can yield valuable items in the form of rare medium armor crafting materials used to construct prototype weapons, prototype schematics for all crafts, and gifts for companions to raise their Affection rating. Research compounds and misc schematics. Treasure Hunting is the ability to track down and recover valuable items by following a series of clues. Companions sent on Treasure Hunting missions can return with rare gemstones used to construct prototype and artifact earpieces, focii and generators, and blasters and electro weapons. Other possible rewards include lockboxes that can contain valuable items or credits and gifts for companions to raise their Affections rating. Underworld Trading entails the exchange of goods and services on the galactic black market. Sending your companions on Underworld Trading missions can yield rare Biochem materials used to construct prototype and artifact implants, rare underworld metals used to construct prototype and artifact droid and heavy armor, and weapon and armor modifications. Other possible rewards include gifts for companions to raise their Affection rating.